At Agile India 2013, we are offering 14 workshops, all under one roof from 16th February to 2nd March. This is a unique opportunity to learn from experts all over the world, don’t miss out! One of the workshops we will be running is titled ‘Kanban Primer’, by Masa K. Maeda. Masa is the creator of Lean Value Innovation, he is an internationally recognized expert on Lean and Agile Project Management, Kanban and Scrum. He started Valueinnova in the Silicon Valley California in 2008. He has spoken at several conferences including Lean Kanban and Agile India 2012. He was one of the favorite speakers at Agile India 2012 based on the feedback we received. We stole some of Masa’s precious time and quizzed him about Kanban and its benefits. 1. What are key benefits of Kanban over the first generation agile methodologies like Scrum? Kanban is a fabulous practice that is equally applicable to technical teams and to management and leadership teams. The biggest benefit of Kanban is that it brings an amazingly effective way to improve process and to generate a culture of continuous improvement with very minimal effort. It is also fun to do. It accomplishes this by being highly adaptive and improving value flow over existing processes. This is great news because it means Kanban is equally applicable to organizations doing Waterfall, Scrum, XP, or other. Yes, this means it also helps improve value generation and delivery over other agile methodologies. It also means it can be applied beyond IT and software development. Some people think Kanban is only good for IT work but that isn’t actually so. We have applied it very successfully to Software Development, Admin, HHRR, Healthcare, Education, Telecommunications, etc. 2. Is it possible to introduce Kanban into an an organization this is already practicing Scrum/XP? Definitely yes. Kanban is compatible with other methodologies. It actually helps improve the performance of Scrum and XP teams. Kanban has been proven to actually make it easer for agile adoption to spread more easily and more quickly. One example of how it helps improve Scrum is by improving the flow of Stories and also by bringing an effective way to handle urgent tasks. For XP teams it allows to better visualize the work to do and being done, aligning better the dev-test activities as well as the UAT. In both cases it increases customer satisfaction because value delivery improves over time. 3. Who is the workshop intended for? It is equally good for executives, managers, and team members. Executives benefit using Kanban, for example, to manage their business and customer portfolios, and by reducing time-to-market. Managers benefit because Kanban gives them visibility and predictability over projects; and by reducing delivery time through continuous improvement. Team members benefit because it increases autonomy, effectiveness, and quality. It is important to understand that Kanban is not a technical practice but rather a discipline to improve what we currently do, be it technical or managerial. 4. What is the key take away for the attendees? 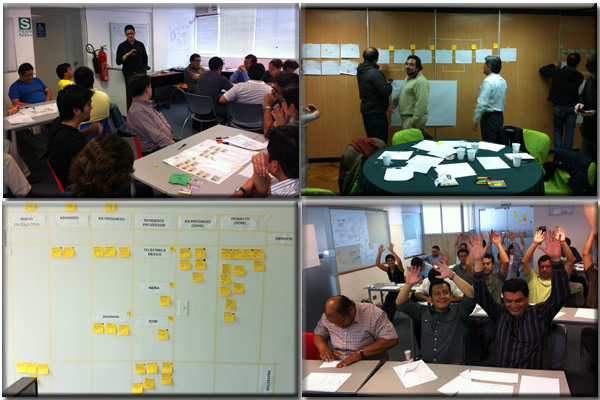 This workshop will allow them to get enough knowledge to get started with Kanban. They will have the bases of its system and the method itself. This means they will be able to figure out how to create an effective Kanban board, generate the key elements to have high visualization, to do root-cause analysis and to effectively increase value flow. The workshop is highly interactive through lots of team exercises. It will be a fun day. Our training typically gets the highest scores during evaluations because of its format and because of the amount of knowledge and understanding acquired by the attendees.